- Is it possible to get value from this indicator from a iCustom function ? - How to set up a logic w/ this kind of indicator ? - Is it possible to apply the Hodrick Prescott function on the ticks line and draw it ? Officially iCustom function is not supported in the current version of the tick chart indicator. However it's possible that you can get High and Low value from the buffers. The current version of the indicator has only MA built-in. 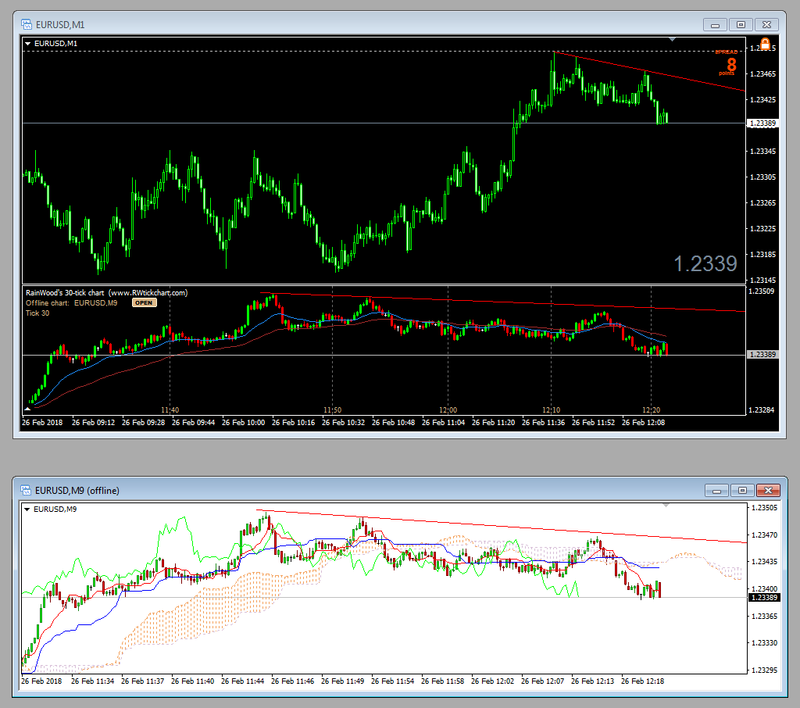 Later versions of the indicator may support offline charts as well where you can add your own indicators. Another question : - How many ticks per second can you fetch w/ this program ? The indicator uses data feed from MT4, so it uses all the ticks MetaTrader 4 gets from the broker. However it is important to point out that the number of ticks MT4 receives changes from broker to broker. New version of RW Tick Chart indicator has been released. • improved tick data collection and saving method - when changing tick chart the indicator now uses the already collected tick data to create the new tick chart. The old version just emptied the tick chart and started tick data collection from the beginning. Very good it is worth sharing. I shared this information on facebook aswell. Version 1.14 of RW Tick Chart indicator is now out. Version 1.15 of RW Tick Chart indicator is out. RW Tick Chart v1.16 has been released. Tell me how the datas (price_close) made by 70 ticks bars can be fetched and transferted inside an EA ? You can query the candle objects properties from MQL code and use it in the EA. New version of RW Tick Chart indicator has become available. Unfortunately using of function iCustom() with RW Tick Chart indicator is not supported since RW tick Chart is much more complex then the MT4 built-in indicators. First you have to add RW Tick Chart indicator to a main chart and keep in mind how many ticks a candle contains (e.g. a 133-tick chart contains 133, a 233-tick chart contains 233). This is defined in the 'Number of ticks per candle' setting of RW Tick Chart indicator. So the current (unfinished) tick candle's name on a 133-tick chart would be "RW-133-tick_CandleBody0"
The last (finished) tick candle's name on a 233-tick chart would be "RW-233-tick_CandleBody1"
The indicator ID can somewhat modify this naming convention. If the indicator ID is set to a non-zero value (e.g. to '74', default is '0') then the name format will change to "RW-233-tick-ID74_CandleBody1"
However please be careful and use this for your own risk as we didn't test this functionality thoroughly. I just did a quick test now and it seems to work OK.
RW Tick Chart v1.20 has been released and it is already available for customers. The new version contains more added options for offline tick chart updating and some other optimizations.